the UK in 2004 and 2005.
female artiste in the world. 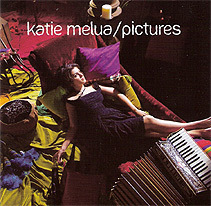 WITH THE SALES OF HER FIRST TWO ALBUMS  Call Off The Search and Piece By Piece  exceeding 7.5 million, Katie's third album Pictures (released 1 October 2007) was awaited with genuine anticipation. in 2005 and has been high (reaching number 2) on the Billboard Top 100 European Chart for over 70 weeks. in Switzerland and one in France, Iceland, South Africa and Belgium. Canada, New Zealand and Sweden awarded her Gold. With her extraordinary achieve-ments it is difficult to imagine how Katie Melua could beat that, but Pictures is an album that will enchant her legion of fans and confirm her status as a unique and remarkable vocalist  her voice 'expands' as she reaches for higher notes and she then schmoozes her way into your heart. Such success could turn the head of the most modest of artistes, but is the pressure on to keep turning out suitable material? Katie explains: "The one thing that I've learnt from making three albums is that you don't know what is going to happen when you start recording. The fact that I am a bit older, have different interests, have more experiences, and that I have grown and developed as an artist means that this album would be different in some way from the first two. I would not want to just try and emulate the success of the previous albums but I also don't feel the need to change for change's sake or to please anyone other than myself." a catchy melody. It sounds retro  perhaps with a hint of folk and Burlesque. Superb. It's All in My Head is hopelessly romantic and If The Lights Go Out is optimism of love in the face of global devastation. The bittersweet tale of love and loathing in What I Miss About You is expressed in softer, huskier tones. Best known and loved for singing open-hearted ballads, Katie didn't disappoint with the first single If You Were A Sailboat, set to follow previous lead singles The Closest Thing To Crazy and Nine Million Bicycles onto the airwaves. 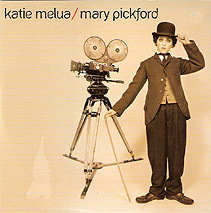 On Perfect Circle, Katie teams up with co-writer Molly McQueen for another classic Katie Melua song that could easily have been released as a single. Continuing the silver screen theme with Scary Films and the Spaghetti Western feel of Dirty Dice  which Katie wrote with Andrea McEwan  the album then closes with Katie's version of Leonard Cohen's In My Secret Life. One of my favourite tracks by the great poet/crooner  who has been part of my life (sadly only in my music collection cabi-net!) since the early Seventies. It is full credit to Katie Melua that she sings it so well. Pictures is terrific and a must-have not only for Katie's loyal band of followers but also for the musically curious. Once heard; never for-gotten. And Katie is justifiably proud of Pictures. She says: "It defin-itely feels like the third part of the trilogy that Mike and I have collaborated on as a creative team. It stays true to what we have always tried to focus on  the lyrics and melody, with emotional songs that hark back to the roots of songwriting."  Katie Melua's album Pictures was released on 1 October (2007). 26 November (2007) on Dramatico Entertainment Limited. As a child (and before she changed her name from the less glamorous Gladys Smith), Mary Pickford ate rose petals as she wished to absorb their beauty. She was discovered by the director D W Griffith, and moved (with her soon to be infamous beauty) from Broadway to Holly-wood. By 1917 Pickford and Charlie Chaplin were the two highest paid movie stars in Hollywood. The moustachioed and swashbuckling Douglas Fairbanks, meanwhile, had become romantically linked to Pickford and the three travelled across the US by train, selling war bonds. Setting up his own production company, Fairbanks soon became the third highest paid movie star. In 1919 Mary Pickford, Charlie Chaplin, Douglas Fairbanks and the director D W Griffith formed the independent film company United Artists. Pioneering, and also seen as a threat to the power hungry major movie companies, United Artists returned the artistic control  and the profits  to the actors. "I like the similarity between United Artists as an independent film com-pany, and my record label Dramatico Entertainment. Working with a small company we have stood up to the big guys, proving that an artist on an independent label can be successful around the world and, in some way, opening the door for other artists and independent labels to do the same." Check out: www.katiemelua.com and www.myspace.